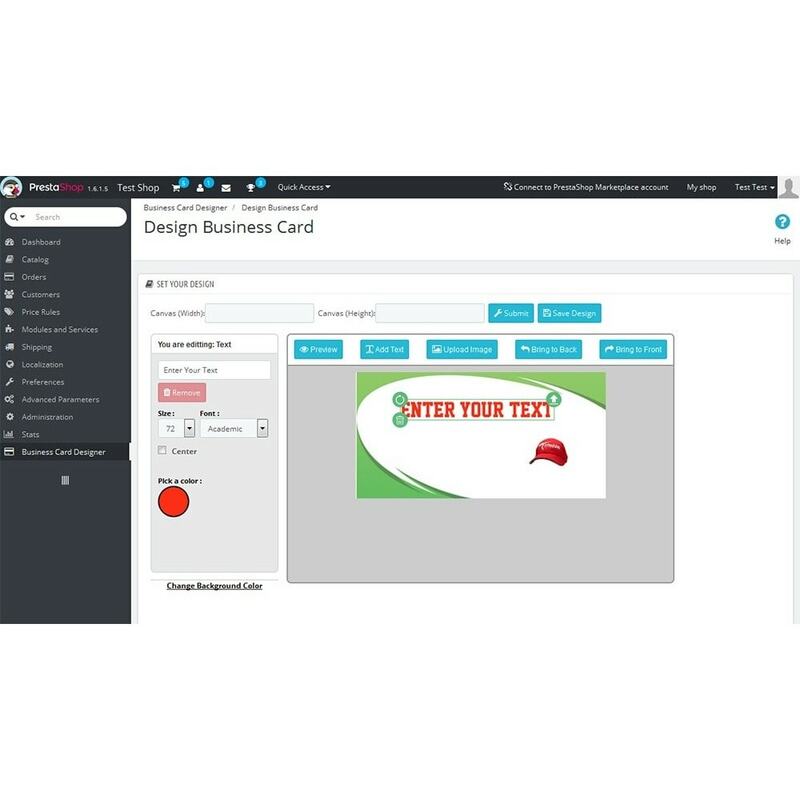 "Business Card Design" module is used to design your own business card. 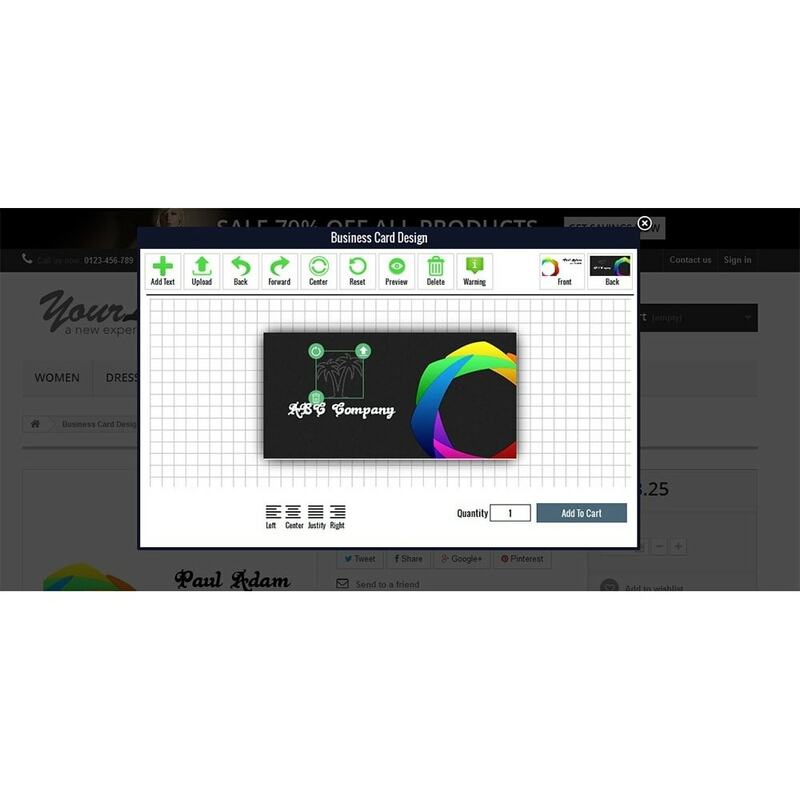 Shoppers can upload their own design, image and company logo on Business Card while shopping. 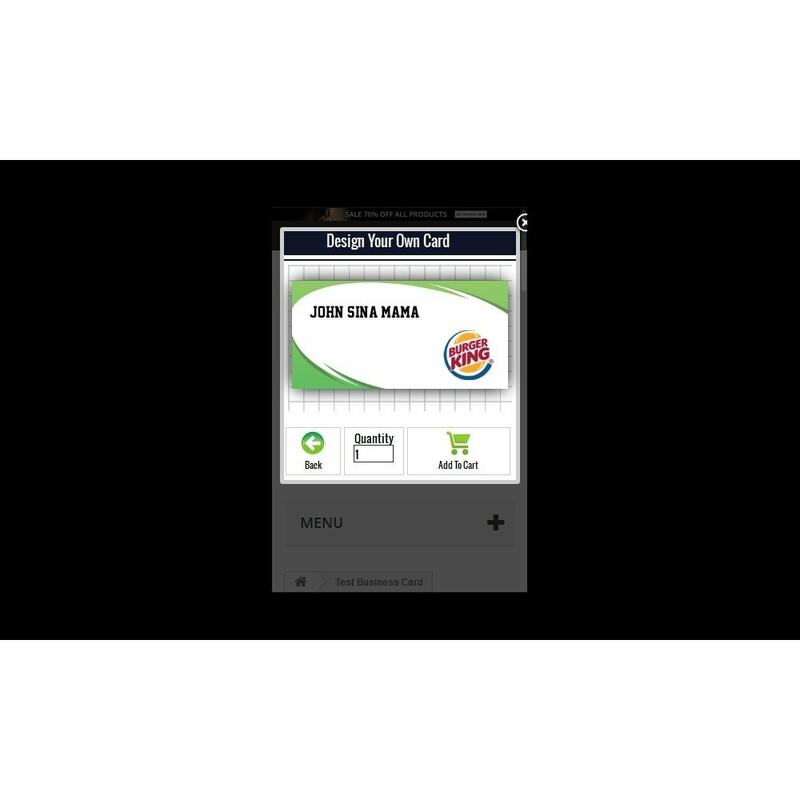 Add Name, Designation, Address, Contact Details, Logo and Images on the Business Card. 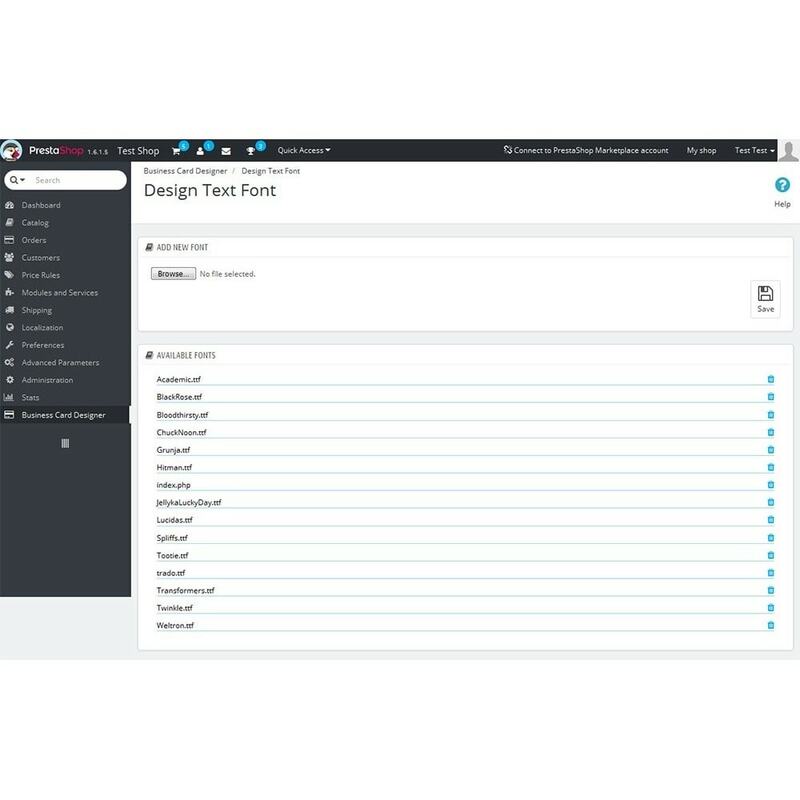 Change Text Font, Font Size, Alignment, Line Height, Text Color, Undo and Redo options. Place text or images in Both Sides of the Business Card. 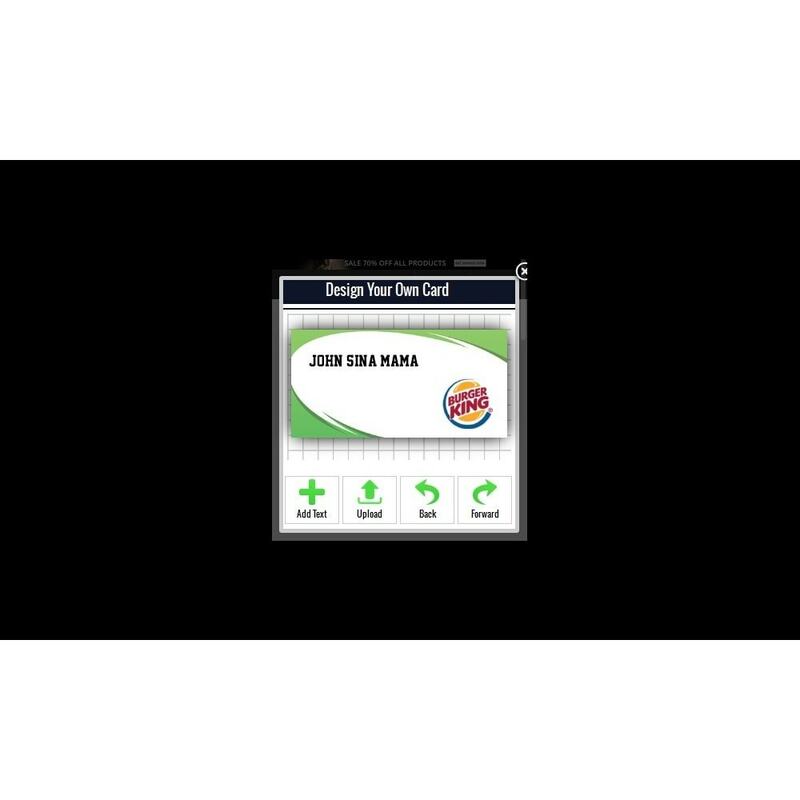 Text and Images can be moved and placed/positioned on anywhere on the Business Card. Shows preview mode of the Business Card as designed. 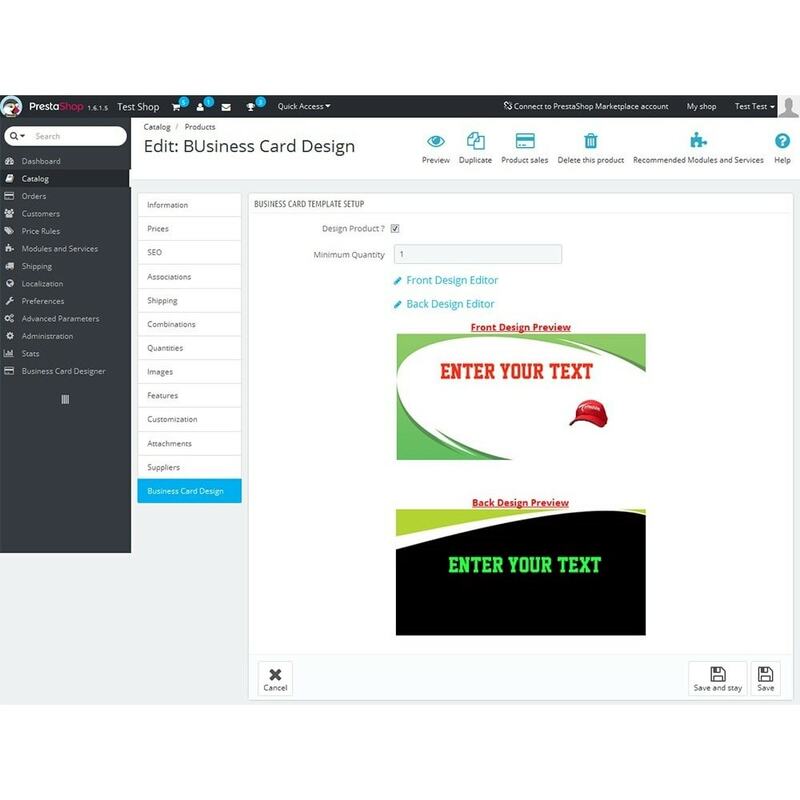 Multiple Text and Multiple Image can be added on the Business Card. 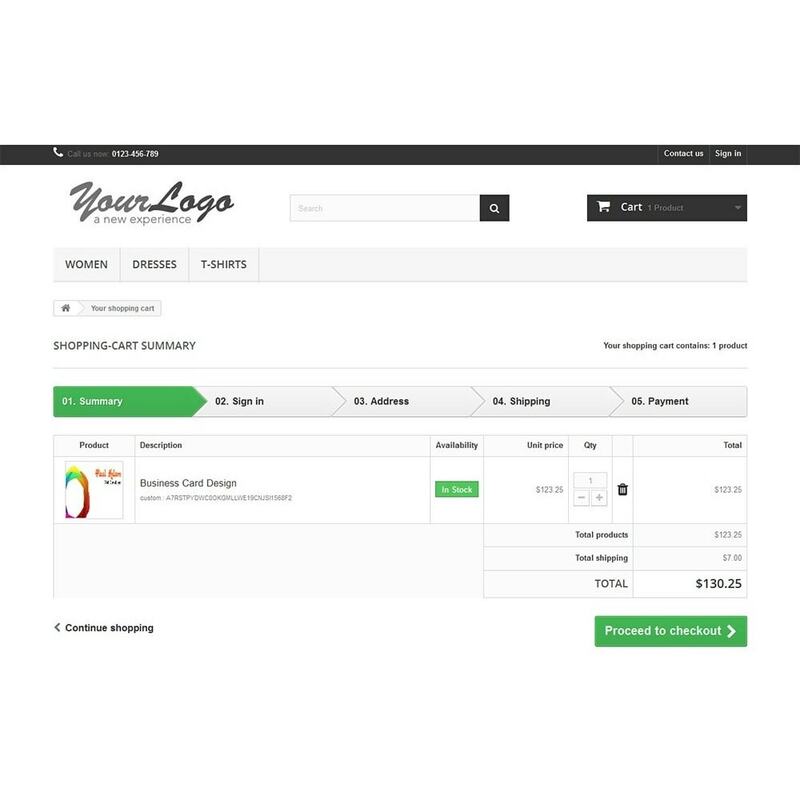 Shoppers can add to cart same product with customization or without customization and price will be different for that purpose. Shoppers can view the Design Information in his Customer Account page. Go to My Account > Order history and details > Details > View Details. text with all text of the module. Admin can set “design popup border” color. 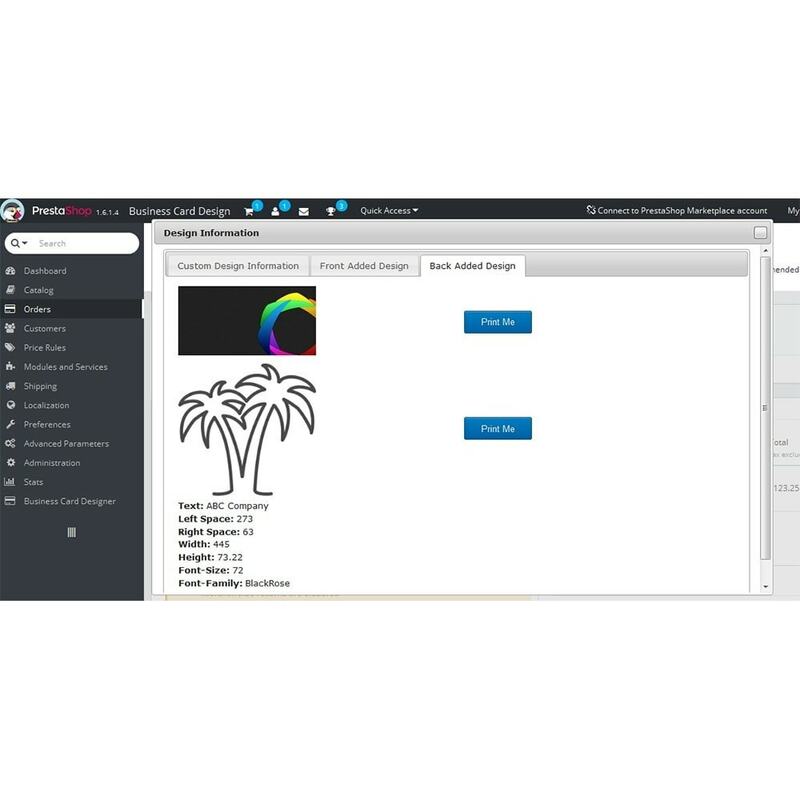 Shop owner can select/deselect customize option for the particular or specific products. 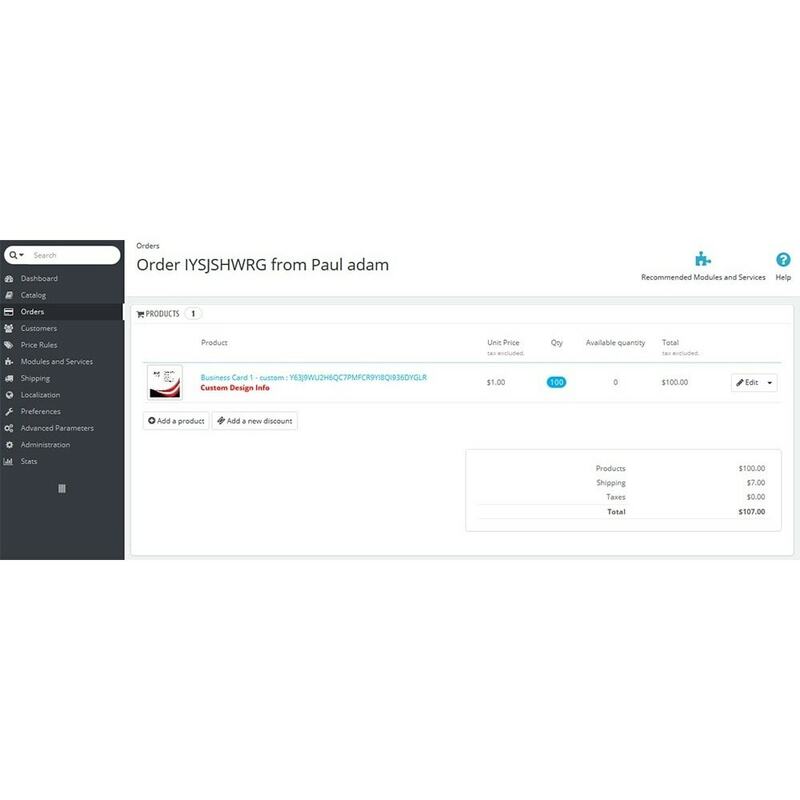 Shop owner can set the “Minimum Quantity” from admin panel. 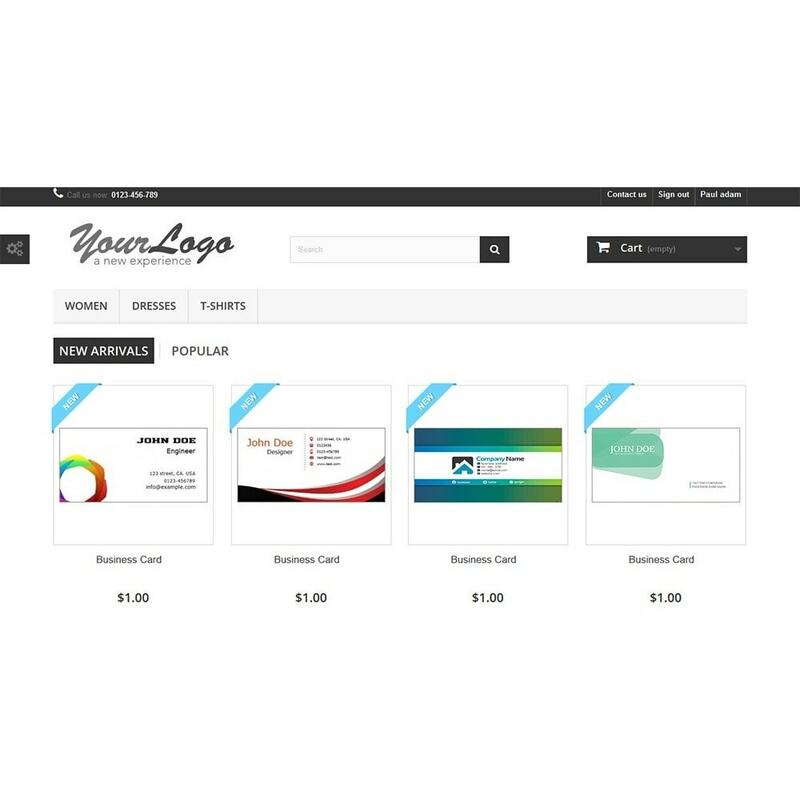 Shop owner can pre design the business card from admin panel and set it to the frontend. Front and back design editors are available. 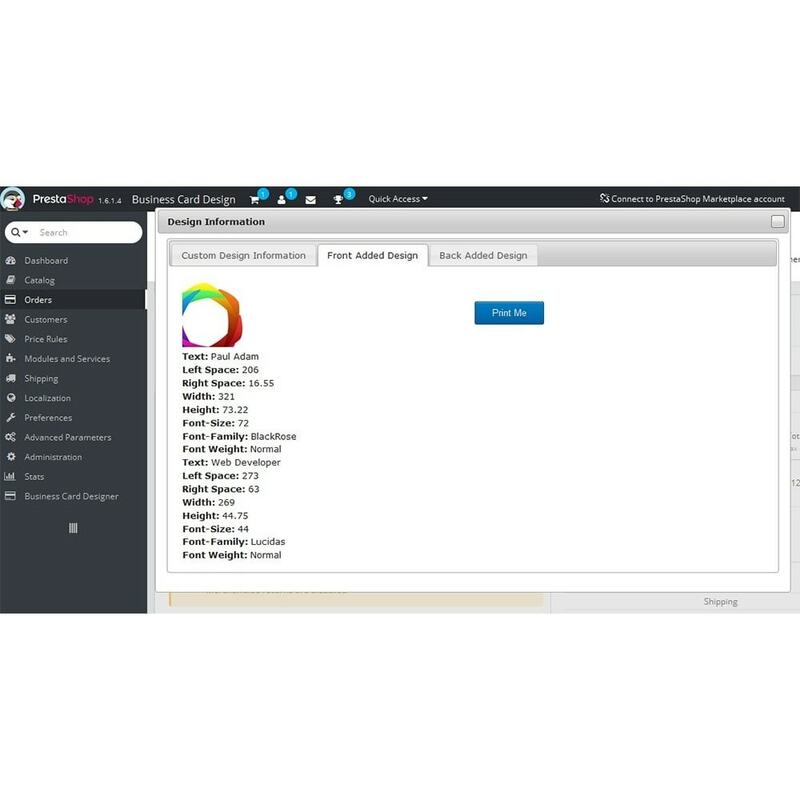 Canvas width and height can be set from admin panel. 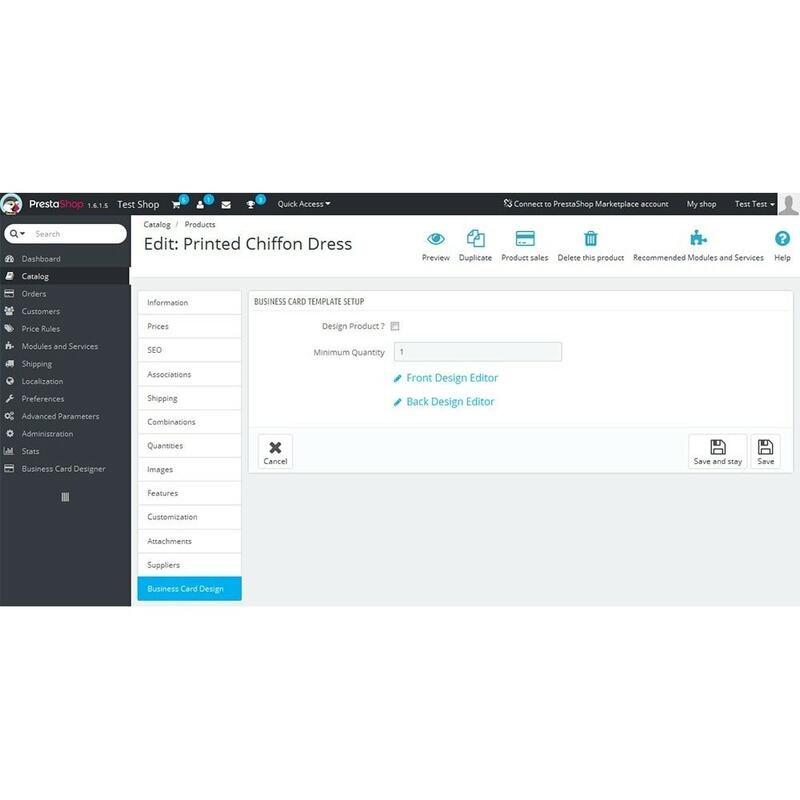 Admin can print and view the customized product from Orders > Orders > View> Custom Design Info. 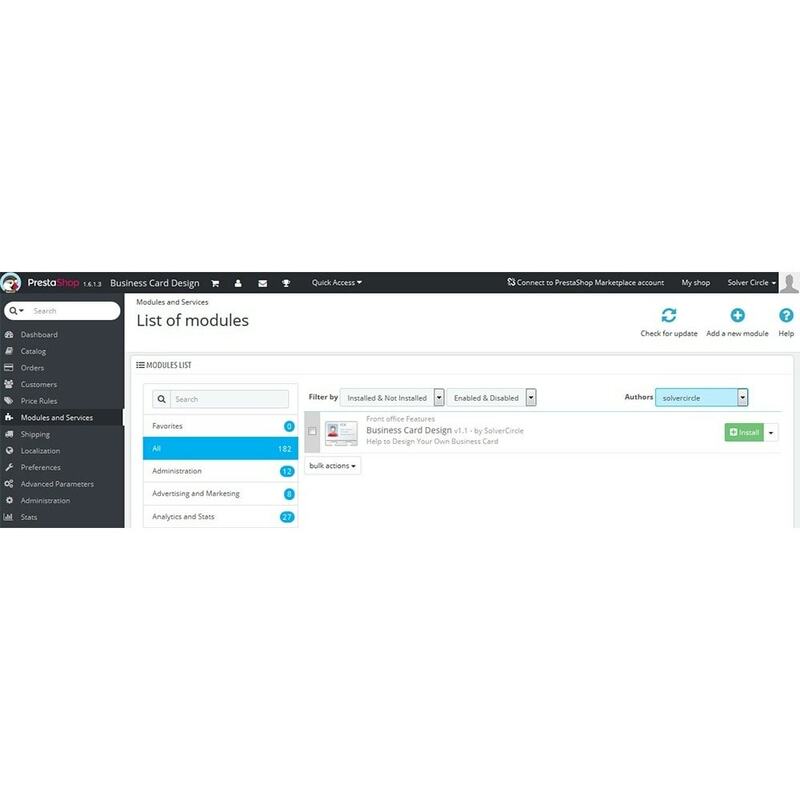 Upload module zip file using prestashop admin module uploader. 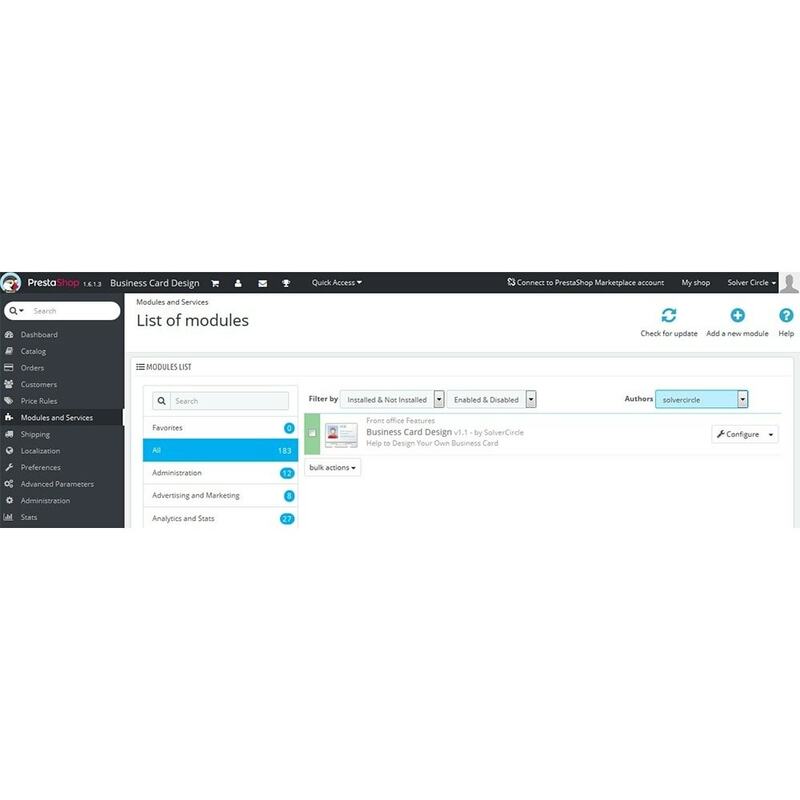 Activate the module from “Modules and Services” menu in Prestashop Admin. 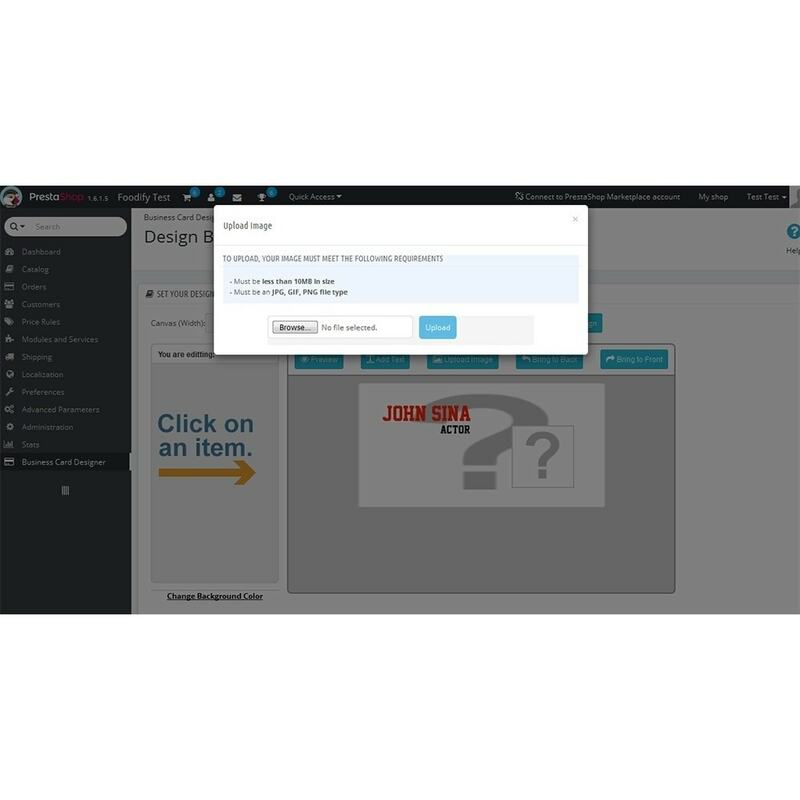 Click on the “Business Card Design’s” “Install” button to install the Module. 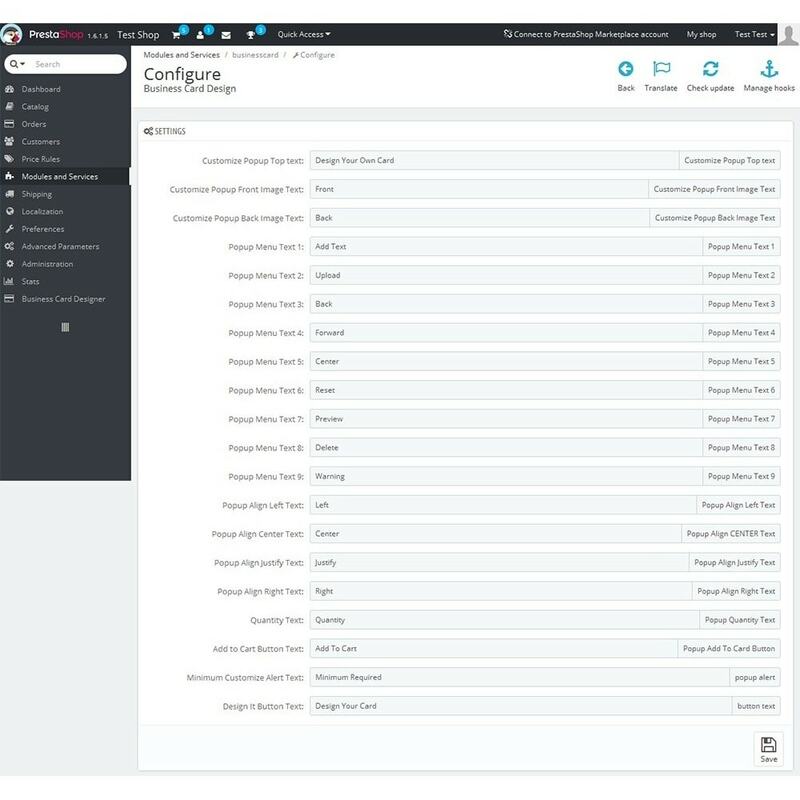 Now go to Modules and Services > Modules and Services > Business Card Design > Configure to configure your necessary settings. (You can customize all the text and color from here). 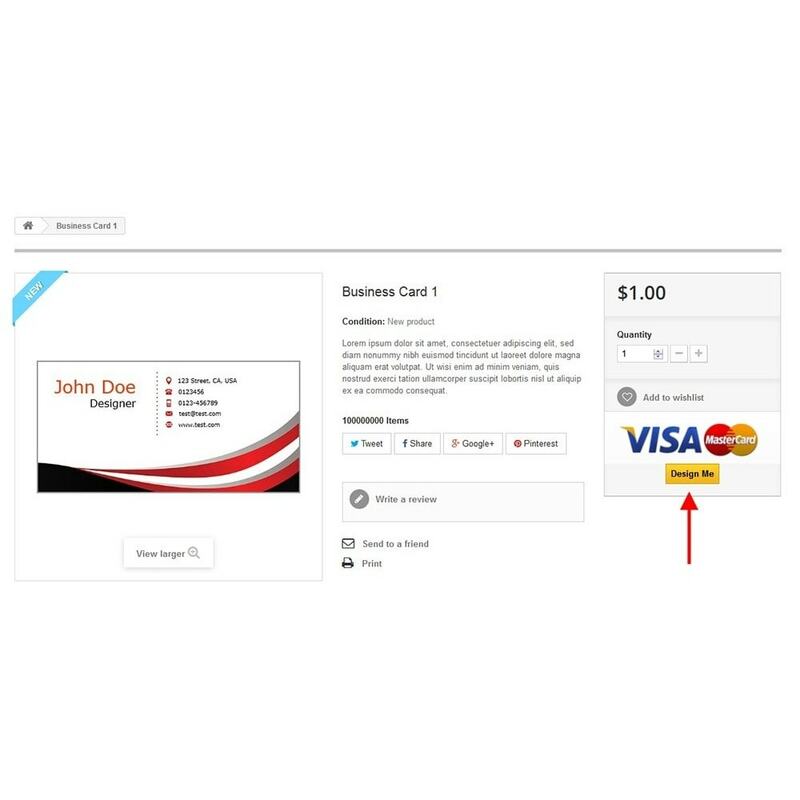 Now add new products from Catalog > Products > Add new product (Insert the necessary fields) and press the “Business Card Design” Tab to set “Minimum Quantity“ and select “Design Product ?” checkbox to allow for customization at frontend. 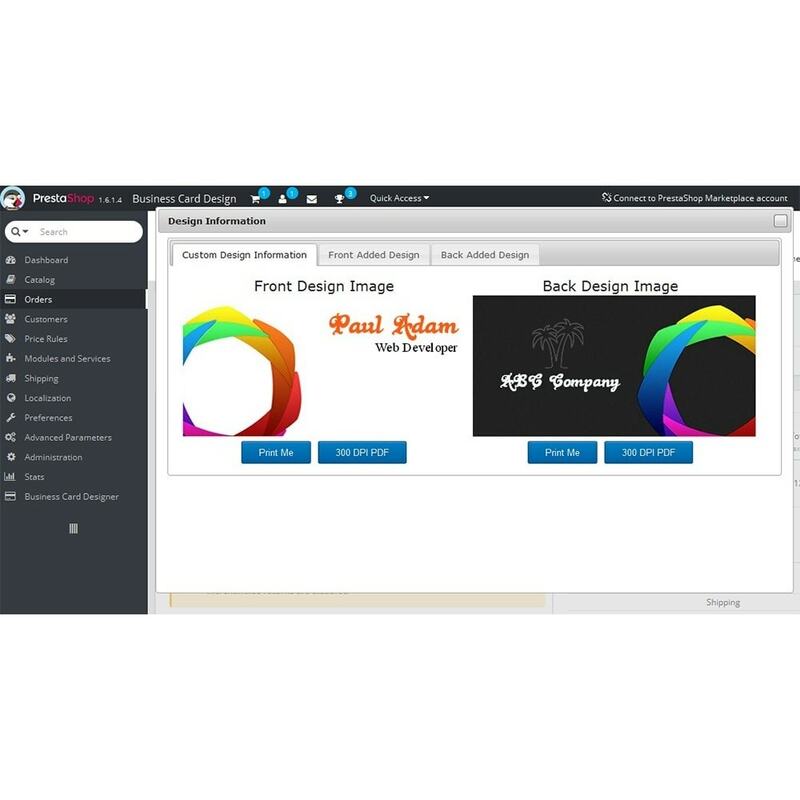 In this option you will find “Front Design Editor” and “Back Design Editor”. Just click on it and set Canvas width & height and press “Submit” button. Now design the business card sample for frontend. Upload card front image from Front Design Editor’s “Upload Image” options and Upload card back image from Back Design Editor’s “Upload Image” options. You can add text and logo from here. 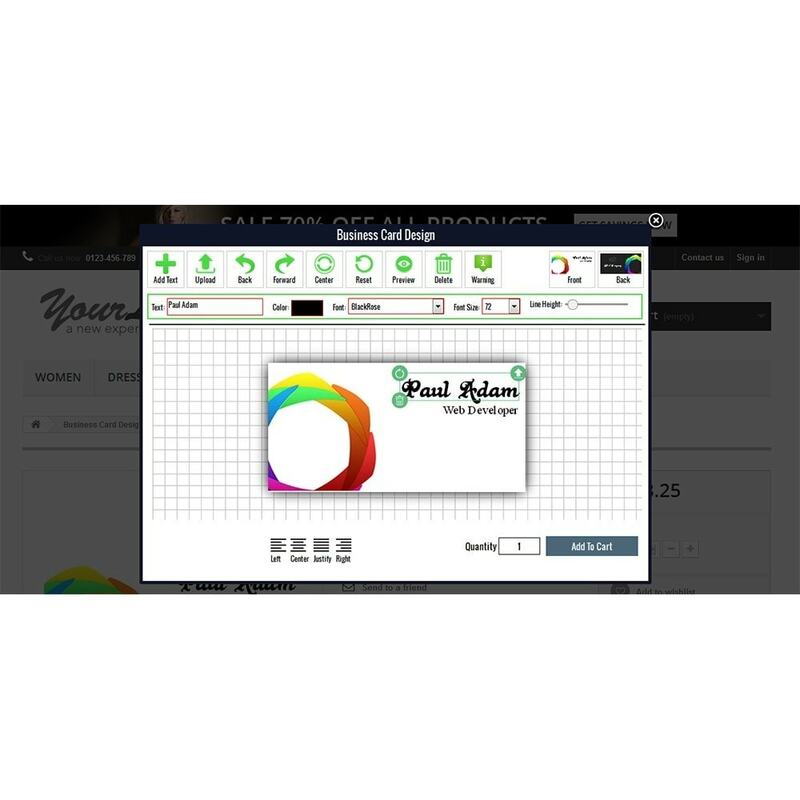 After complete the design click on “Save Design” button as well as save on products editors “Save” button. 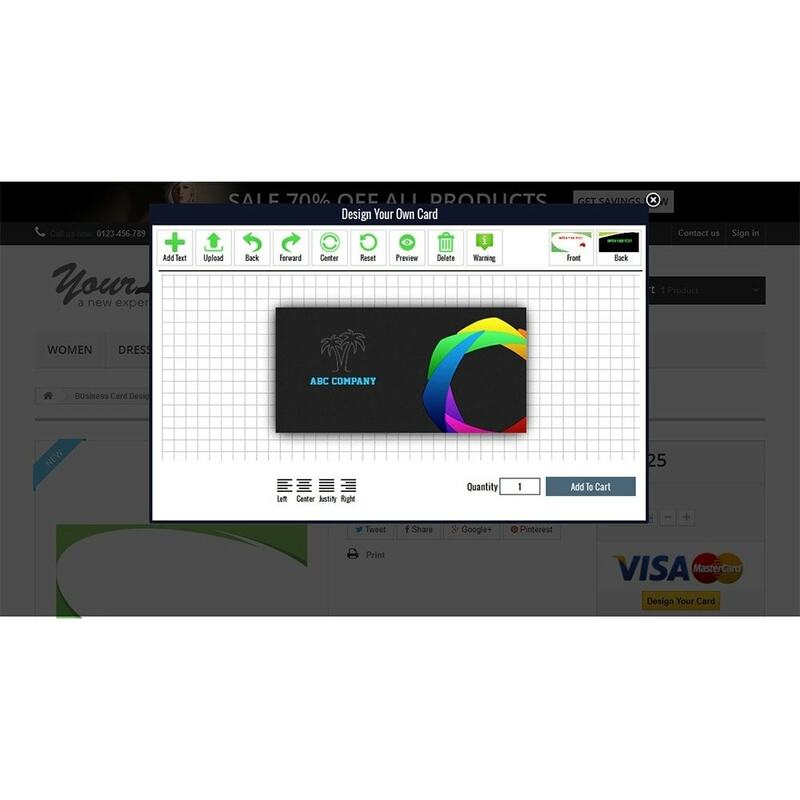 Now check it at frontend (go to products detail page and click on to “Design Me” button). You can add new font from Business Card Designer -> Design Text Font. "Foodify Restaurant Food Menu" best plugin for wholesale buyers. "Custom Product Design Studio" help to Personalized any Product such as T-Shirts, Hoodies, Jackets, Polo Shirts, Shirts, Tops, Pants, Shorts, Sportswear, Apron, Mugs, Bags , Caps, mobile case, Sandal, Shoe, Buttons, Pillow cover, Bed cover etc.